When it comes to youth sports, concussions have not always been taken seriously. That’s changing rapidly, however, as athletes, coaches and parents are becoming much more aware of the seriousness of these brain injuries. That’s a positive development, because concussions can cause long-term problems with brain function – especially for athletes who resume playing before the concussion has fully healed. With new information coming out frequently, parents are not always aware of the most up-to-date recommendations for concussion care, says Christopher Giza, MD, UCLA pediatric neurologist and director of the UCLA Steve Tisch BrainSPORT Program. “In the past, there was often a tendency to downplay the significance of concussions,” Dr. Giza says. Now, some concerned parents might take overly restrictive precautions to protect their child and inadvertently complicate their child’s recovery, he adds. A recent national survey asked parents how they would care for a child whose concussion symptoms lasted more than a week. More than three quarters of parents said they would probably wake up the child during the night to check on him or her. That’s not only unnecessary, Dr. Giza says, but could be harmful. “We encourage sleep very early on because that will help the brain heal faster,” he says. When a child is healing, it’s important to avoid contact sports and activities that can put him or her at risk for further injury. But most parents surveyed said they’d keep their child from participating in any physical activities if they had symptoms a week after a concussion. That’s not necessary either, says Dr. Giza. Prolonged inactivity isn’t helpful, and gentle exercises like walking or riding an exercise bike are perfectly safe, he says. Plus, regular physical activity can boost a child’s mood as he or she recovers. Concussions can cause problems with memory or concentration, which can make it hard to concentrate on schoolwork. But symptoms can vary, and you don’t know what a child is capable of unless you let him or her try, Dr. Giza says. He recommends that children with concussions continue doing some schoolwork as their symptoms allow, so they don’t fall behind. Children who are healing from a concussion might be tempted to turn to their computers, smartphones or TV to pass the time. Unfortunately, such electronic devices can over-stimulate the brain and make concussion symptoms worse. The symptoms of concussion usually peak 24 to 48 hours after the injury. As children show improvement over the following days, they can gradually resume their regular activities. 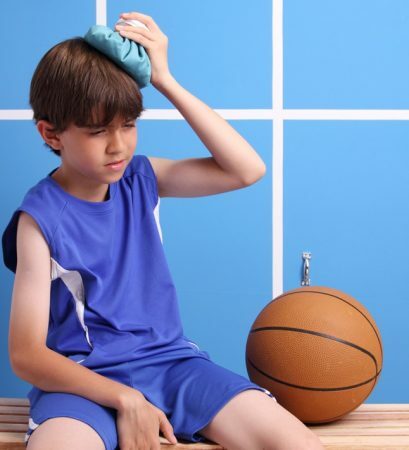 While every concussion is different, most symptoms should subside within two to three weeks. If you suspect your child has suffered a concussion, or you’re concerned about lingering concussion symptoms, see a doctor right away. Visit the UCLA Steve Tisch BrainSPORT program to learn more.